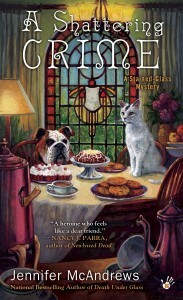 FINAL INSTALLMENT OF THE STAINED GLASS MYSTERY SERIES! 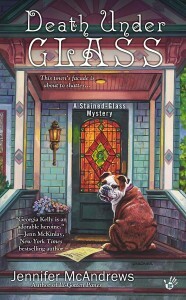 It’s death by Danish in the newest mystery from the national bestselling author of Death Under Glass, featuring stained-glass enthusiast and amateur sleuth Georgia Kelly. Georgia’s day-to-day routine finally seems to be lining up. Stained-glass projects in the morning, clerical work for a law office in the afternoon, and waitressing in the evening. Best of all she gets to spend relaxing Sundays with her new boyfriend. But that comfortable pattern is about to be broken. First Georgia’s cat goes into heat and literally disturbs the peace. Then Georgia’s mother drops in for a visit with her new husband in tow. But everything falls to pieces after a local activist is found dead from a poisoned danish. Authorities quickly put the heat on Rozelle, owner of the local bakery, but no one in town believes Rozelle capable of murder. Now it’s up to Georgia to crack the case and foil the real killer’s plans before the tranquility of Wenwood is shattered. 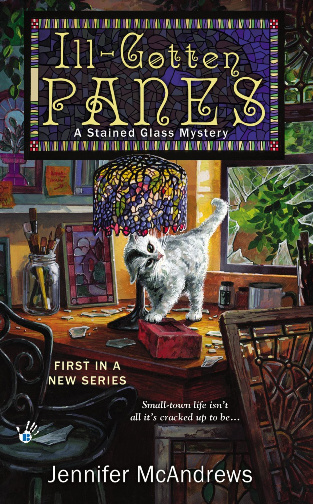 Jennifer McAndrews’s ILL GOTTEN PANES is a smashing debut mystery full of small town chicanery, charming characters and a plot that kept me guessing. Georgia Kelly is an adorable heroine whose clever wit and humor made me laugh out loud! Ill Gotten Panes is filled with small town characters, intelligent cops and a heroine who feels like a dear friend-one you want to sit down and spend time with- as she figures out who is who in Wenwood and how she fits into her new home.